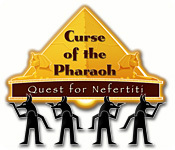 Curse of the Pharaoh: The Quest for Nefertiti is rated 3.2 out of 5 by 28. 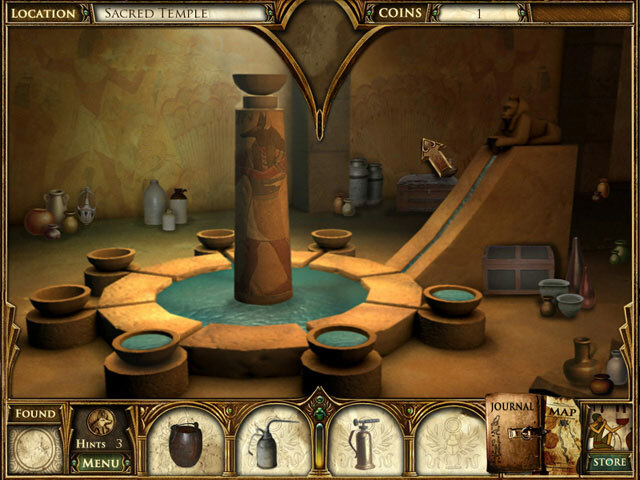 Rated 5 out of 5 by pennmom36 from Curse of the Pharaoh: The Quest for Nefertiti Curse of the Pharaoh games are some of the most entertaining hidden object-spot the difference games out there. Each scene has 3 coins to collect which can be used to purchase helpful items such as a double cursor, hammer, mirror, flashlight, oxygen tank and even an extra hint. Wipi will pop out occasionally and if you catch him he will give you an extra hint as well. Each scene has an item to collect that will be used to repair an item in the scene and you collect pieces of a mask as well as various puzzle pieces. At the end of each level you will use those puzzle pieces to play a mini game before moving on to the next level. 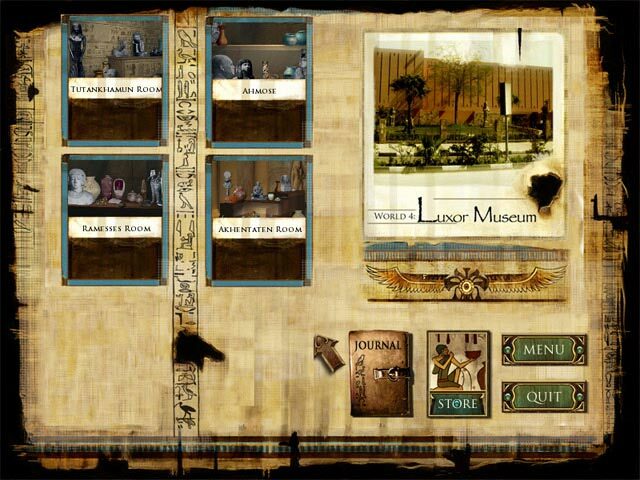 If you are like me and love Egyptian themed games, this is a must try game, enjoy! Rated 5 out of 5 by FORTUNATUS from Enjoyable entertainment!!! Where was THIS game hiding??? I am loving it.... has variable gameplay and nice graphics. I enjoy variation so the find the difference puzzles and ALL the puzzles mix with adventure are SO MUCH FUN. Even though it apparently was released some time ago, it's more fun than I've had with any DEMO in ages. Off to buy!! YAY! Oh happy day. Rated 5 out of 5 by JulieJay from Curse of the Pharaoh : The Quest for Nefertiti This was about the 3rd game I ever bought in 2008 and still play it. It's kind of difficult to describe but it's sort of an Interactive Spot the Difference Puzzle Adventure with a few HO's. 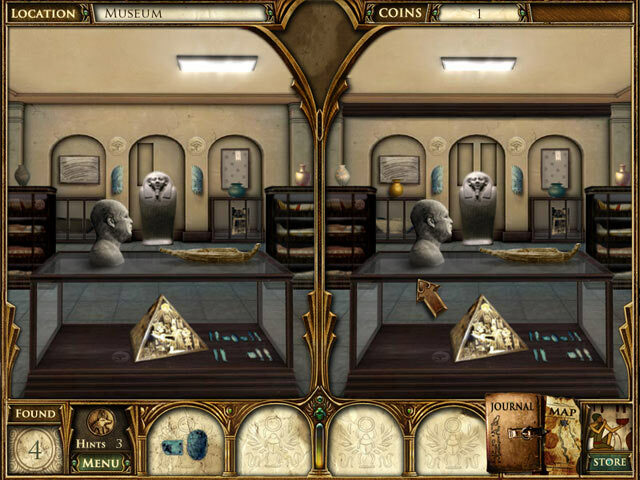 In each chapter, you play between a number of scenes spotting the differences (and collecting coins). In each scene you get an inventory item and you have to find where to put it. It could be in the scene you found it in or one of the others. When you've completed those scenes, you unlock a secret room where you have to find a handful of hidden objects by shadow. You also need to find the fragments of a pharoahs mask. At the end of each chapter, you then unlock a final secret room with the mask and use the objects you've just found to complete a puzzle. Don't be put off by the too much handholding first chapter as it's just learning you the ropes. Absolutely brilliant game and I can't recommend it enough. Rated 5 out of 5 by outhousse from curse of the pharaoh the quest for nefertiti i loved this game and it was excellent good story line plenty of mini games to play .i have played it through twice now and never get bored with it. Rated 5 out of 5 by hodgepodgespv from I did have to start over once but that's sort of what it's all about, sometimes you win, sometimes you don't. but i was having so much fun, i didn't mind starting over. AND there is a walk thru so if you are kind of new, you have a life line! like i have said before, after playing one of the games, i had to play the other 2! i will play this one again. Rated 5 out of 5 by Gojira2006 from Pharaonic Fun A relatively short game with lots of spot-the-difference scenes, as well as puzzles that close out each chapter that are easy to moderate in difficulty . . . The story line is interesting, & is continued in the next two games of the current trilogy . . . I wasn't too impressed with the graphics, which I think contributes to making some of the differences to find in some scenes an extra challenge . . . This is mitigated by the game giving you a hint with a little sparkle near the difference, though, in the easy mode of play . . . Wipi, the little companion, is always on hand to give some help . . . ! With the option of either easy or difficult modes, this is a very fun game . . . Rated 4 out of 5 by Eveoflove from The 1st of the 3 stories Review based on the completed game in "hard" mode; it has fewer "sparkling hints" and appearances of Wipi (click on him for an extra hint) than the "easy mode". The strength of the game lies in its storyline... which unfortunately needs to be read as there are no voice-overs. The Egyptian setting adds a unique color to the scenes you will be exploring. The game consists of 9 "worlds", each using 4 scenes where you play a game of "spot the 10 differences" and can also collect 5 coins to spend in the store; each scene also contains a "puzzle item", which must then be placed in its relevant scene. After completing the 4 scenes, you gather a few objects and pieces of a mask in a 5th scene; the mask allows you to unlock a 6th scene which is more or less a minigame/puzzle (I do NOT mean a jigsaw). You can gain additional hints by clicking on Wipi when he appears for a few seconds on the side of the scene (NOTE: if you equip yourself with the double cursor, you must use the arrow-shaped pointer to click on him, not the ring-shaped one.) The game is not very long (about 2 hours) and fairly easy as the same "tricks" are used to create the differences. I played this game using Windows 10 without any issue; personally, I found this game to be the weakest of the trilogy: "Curse of the Pharaoh: Napoleon's Secret" is better and begins its timeline when this one ends. Try it but keep in mind it is NOT really a hidden object game!